STS Young Endeavour is Australia's sail training flagship. Young Endeavour to the people of Australia by the British government in 1988, as a gift to celebrate Australia's bicentenary. 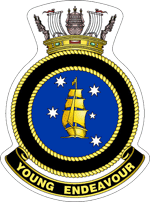 Although operated by the Royal Australian Navy, Young Endeavour is primarily used to provide sail training to Australian youth through the Young Endeavour Youth Scheme. Up to 24 young Australians embark on each voyage and participate in the internationally recognised program, delivered by the Navy staff crew. Since 1988, over 13,000 young Australians have participated in the program, which develops teamwork, leadership, communication, resilience and instils a sense of community responsibility. Image courtesy of Young Endeavour Youth Scheme. STS Young Endeavour underway off the east coast of NSW as she makes her way back to her home port of Sydney.